Last year, when Art Asylum split up their Universal Monsters Minimates sets into two-packs for Toys Я Us, they did it very cleverly: of the eight figures in the specialty sets, six were carried over to the mass market, and two were left exclusive; to round out the TRU assortment, a single pair of figures was created that would be exclusive to the mass market. This year, that trend was not continued. Dracula and Van Helsing were paired together - that made sense. So did the set featuring Frankenstein and his monster. But then we had the Bride of Frankenstein, and the only leftover figure to pair her with would have been Renfield, which would make zero sense, so now Renfield is unavailable at the mass market (along with Mina Harker and Elizabeth Frankenstein), and the Bride needed a new partner. So AA came up with something that made sense, but we're still left with a duplicate Bride of Frankenstein. Everything we said about her in the Frankenstein review is true for this figure: the paint, costume and accessories are all identical. As Rustin bemoaned weeks ago, this is a severely missed opportunity. We're not saying they shouldn't have put the Bride out, we're saying they needed to do something different with her, something to set her apart from the boxed version. Fully paint her bandages, so we can display her without them. Change the expression on her face to an open-mouthed scream (actress Elsa Lanchester based the sound on hissing swans). Include a bandaged head. ANYTHING to make buying two of her sting less. Especially since the figure that comes with her in the two-pack is so fun. To live in the village near Castle Frankenstein is to live dangerously. When young Henry's abominable creation stalks the countryside, no man, woman or child is safe, and the villagers must ultimately band together to exact their own justice. An angry villager! 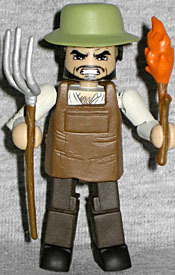 Complete with a pitchfork and flaming torch! And not just any angry villager, but Ludwig, the father of Maria, the young girl the monster accidentally drowned. Actually, that was one of the things censored from the film: the monster seems to throw the girl like a foot from shore into about two feet of water, yet she drowns? It seems nonsensical. But nothing more explicit could be shown. This is Ludwig as he dressed when he left Maria to play by the lake: he's wearing plain pants and shoes, and a simple tunic that shows off his chest hair. Above that is a removable leather apron, a new mold with a little bow sculpted on the apron strings in the back. He's got an angry look on his face, and has a beard and mustache. He's also got a hat that sits way too high on his head. Remember Flash's helmet? It's the same problem that figure had. On Flash, it was excusable, since his helmet was so flat, but this hat is tall and roomy, yet it's perched on the head in the stupidest way possible. Ludwig's hat was comically tall, but it still started at a normal place on his head. 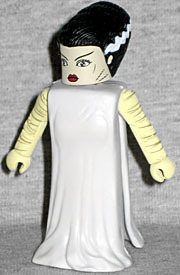 The Bride of Frankenstein is fine, if you didn't already buy the four-pack. And the Villager is mostly cool (especially his accessories), but the poor design of his hat keeps him from being great, and consequently keeps him from being a must-buy. And when the Villager isn't a must-buy, this set isn't a must-buy. It may not even be a maybe-buy. If this were just some random peasant, instead of an important character, we'd be telling you the set wasn't good enough to buy, so making it Ludwig was smart on AA's part. This entry was posted in addendums, Art Asylum, MMMR and tagged Minimates, Universal Monsters. Bookmark the permalink.